Home » Need Neck Pain Relief? Get effective treatment! 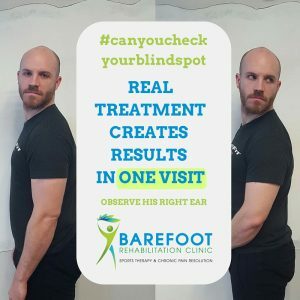 Barefoot Rehab used to be a “chronic pain management” practice. Then, people kept calling asking for prescription pain medications. Finally, we realized we were talking to people who did not want to get out of pain. That’s why we’re not a “chronic pain resolution practice”. Resolution is what happens when you get the cause of the problem treated. Resolution is the permanent reduction in your symptoms without ongoing treatment. Like in our friend David above. His symptoms didn’t respond as quickly as his range of motion did. But we explained to him that when his range of motion increases, it’s a sign that there’s less adhesion (think “glue”) in his neck. With less adhesion, he would be more flexibile and stronger than before. Before he was ever treated, his chin was about 1.5″ from touching his neck. Five minutes later after treatment, his chin was 0.75″ from touching his neck. 48 hours later, his chin was still 0.75″ from his neck! After 3 visits, David started to notice that his C6 nerve symptoms in his thumb and pointer finger were diminishing. He’s still being treated and isn’t fully resolved yet, but he’s on the path of improvement! 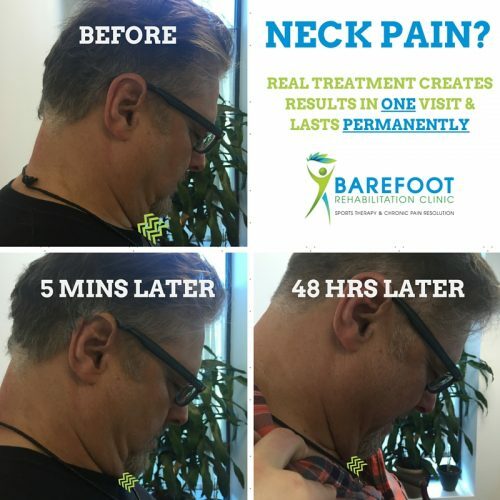 What does neck pain relief look like? Neck pain relief looks like improvement in range of motion in a five minute window. Look at Thomas and Sara’s right ear below. You can hardly see it for Thomas before treatment. With Sara, you can’t see it at all. 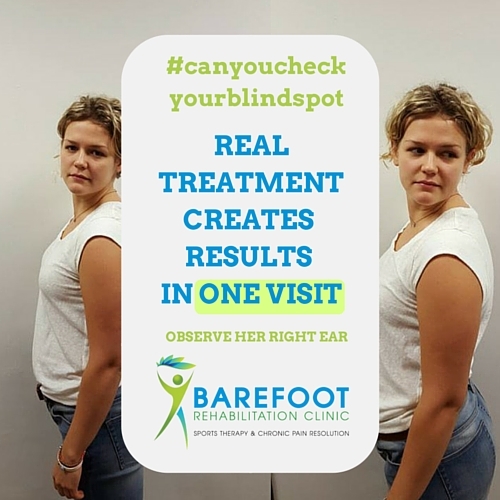 After they get the adhesion removed, the right ear is clearly visible, showing they improved rotation range of motion. How long have you been treated for your neck pain without a range of motion change? Please share your experience.